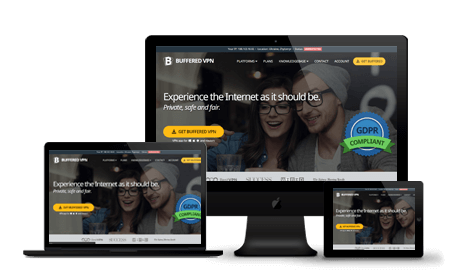 Buffered VPN provides a fantastic range of VPN (virtual private network) services that combines incredible speed, usability, and some of the best customer support on the market. As a newer addition to the VPN market, the Hungary-based company has gained a solid reputation in a short time, thanks to the great features on offer. It might be considered slightly more costly than other VPNs, but users will certainly get good value for money. Buffered VPN offers three pricing options. They could be seen as expensive when compared to many other VPN providers, but you are definitely paying for a high quality service. Users can experience some savings when taking out a longer subscription plan. The only difference between each plan is the length of the subscription, with a small saving for committing to a longer subscription. Regardless of which option you choose, all users are offered a 30-day money-back guarantee, which can be very helpful if you feel the service is not for you. This is a useful option, particularly because there is no free trial offered by Buffered VPN. No matter what you are looking for from a VPN provider, be it private internet browsing or access to restricted websites and content outside of your country, Buffered VPN has a comprehensive package of tools that covers everything you could hope for with a VPN. Looking to stream content using a VPN? Buffered VPN certainly delivers on that front, as it provides some truly impressive bandwidth speeds due to its optimized servers. This allows users to enjoy HD video and music streaming from the likes of Netflix, Spotify, and Amazon Prime Video. With servers based in so many different countries, and many server options throughout the United States, it is simple to find an appropriate server for streaming media content, no matter where you are browsing from. Buffered VPN offers solid levels of encryption. It may not be up there with the best, but the level of security on offer here will be more than enough for the average user. It covers all the main privacy and security features you would want from a VPN, including a comprehensive selection of VPN protocols and reliable encryption, and there are absolutely no browsing logs kept! Buffered VPN supports most common operating systems and a wide range of devices, including Windows, Mac, and Linux. It also works on various games consoles, smart TVs, and even e-readers, so you’ll surely find it serves your needs. There are no apps for mobile devices at the moment, but Buffered VPN’s website is very mobile responsive. With other apps such as Open VPN for Android that can be used in conjunction with Buffered VPN, you’ll be able to use your Buffered VPN service on five separate devices at the same time! Unlike many other VPNs, Buffered VPN could not be easier to install and use. A user-friendly interface makes setting up Buffered VPN really straightforward on any operating system, which is really helpful for anyone who feels unsure about installing new software they are unfamiliar with. One of the biggest allures of a VPN is the security and privacy it offers. Buffered VPN certainly delivers in this regard with a number of fantastic VPN protocols that allow for safe and secure anonymous browsing. Any traffic between your device and the Buffered VPN servers is protected through powerful 256-bit Blowfish encryption. This ensures all activity is comprehensively hidden from anyone, including governments and cyber criminals. Moreover, you can rely on this fantastic level of privacy no matter where you’re browsing from, including on public Wi-Fi networks. In addition, Buffered VPN ensures that there are absolutely no browsing logs being recorded, and that no information will be passed on to third parties. All of this means that a user can never be connected to their browsing activity, since there is not a single record of it. Plus, shared servers are used to ensure that every user’s personal identity is fully protected. Another very strong feature of Buffered VPN is the amazing customer support. With the option to contact support by either phone or email 24/7, you’re sure to quickly get the help you need. Support staff can be contacted through a live chat tool as well, so there are many ways to speak with them, should you require some help with your software. Expect fast replies with helpful information about any question you may have. There is also a wide range of tutorials that provide great additional support, including clear instructions on how to install and operate Buffered VPN on any operating system. Simply put, Buffered VPN is one of the fastest VPNs out there, offering incredible connection speeds that will appeal to a number of users. Anyone looking for a VPN to browse a number of streaming services that might not normally be available to them will find that Buffered VPN certainly delivers. HD streaming launches almost instantaneously, with videos operating smoothly in a matter of seconds. Browsing speeds remain highly impressive even when using Buffered VPN on a mobile device. Being very user-friendly is one of Buffered VPN’s strongest features. VPNs can often scare off users that aren’t the most tech-savvy, but this isn’t the case with Buffered VPN. After finalizing your subscription, a link is sent via email that will allow you to download the software. Set up is really easy; just a few clicks, and you are ready to go. As soon as Buffered VPN is up and running, you can connect to a preferred server. While those seeking a more powerful VPN may feel there are some things lacking, Buffered VPN is still a great interface for your average user that is super simple to install. Unfortunately, there is no app yet for mobile devices. But there are third-party applications that can be used together with Buffered VPN to gain access to it on a mobile device and that will have it running smoothly in no time. This might not be the most comfortable option for users that have little experience with VPNs, but due to the continual rise in popularity of Buffered VPN, it is highly likely that apps for both Android and iOS will be developed sooner rather than later. Buffered VPN is a great VPN that will appeal to many different users, particularly because of its consistent speeds. With plenty of reliable VPN protocols, some of the fastest connection speeds (ideal for streaming), and thorough privacy and security protections, it has everything you could want from a VPN. The average user will find it quite simple to install and can be assured that they can always rely on around-the-clock customer support to help troubleshoot any issues.